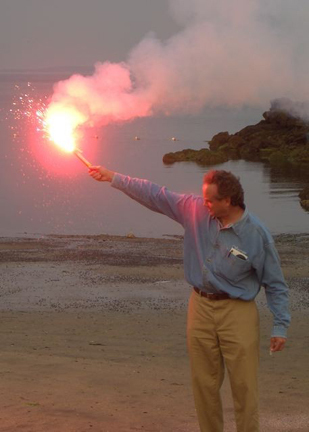 Flare Off Starts the Season with a Bang on Long Island Sound! Orange smoke makes an effective day signal. Rye PB Officer Olivier instructing on proper deployment. 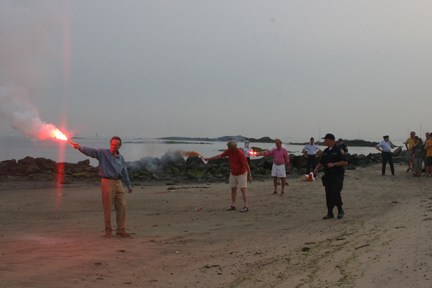 Boaters off Milton Point in Rye were busy calling the US Coast Guard on the evening of June 1st, as the sky over the American Yacht Club (AYC) glowed with an hour-long barrage of aerial distress flares and other pyrotechnic signaling devices. 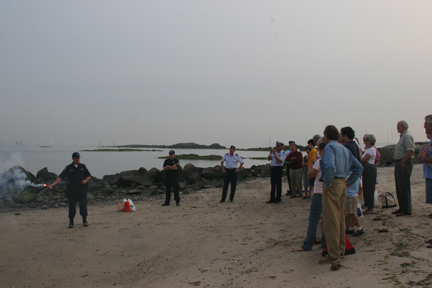 Fortunately, the Coast Guard was well aware that boaters representing area yacht clubs were attending a Safety Seminar conducted by Captain Don Lloyd of Division 6 of the USCG Auxiliary and the Rye Police Harbor unit that allowed the attendees to discharge their out-of-date distress signaling flares and smoke devices. Hosted by AYC, about 70 attendees from AYC and the Indian Harbor, Stamford, Larchmont and Riverside Yacht Clubs took part in a “Flare Off” that offered them an opportunity to gain hands-on experience in discharging flares they are required to carry on their boat. As the devices carry expiration dates, this was an opportunity to “retire” the devices while actually learning how to deploy them. Rye Police Officer Gary Olivier, who trained the group in proper firing procedures, expertly supervised the “firing line”. The shore-side live fire exercise was preceded by a detailed safety seminar in the AYC Clubhouse conducted by Captain Don Lloyd and Officer Olivier. Providing event support were several other members of Division 6 from the USCG Aux., Rye Police, Rye Fire Department and the Mamaroneck Marine Police. 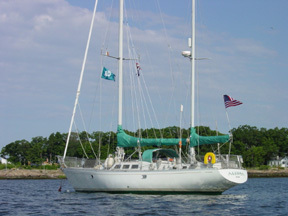 Tim Kent , a solo circumnavigator who finished second in his class in “Around Alone” several years ago he subsequently lost his boat in the “Bermuda One-Two” when the keel fell off. He grabbed the flare kit as he was swimming out from under the hull. It was the middle of the night, which is when all things of this nature happen. When Tim spotted a cruise ship on the horizon and went to set off a flare, he realized he had no idea what to do and could not read the instructions which were in tiny type in red on a yellow background (i.e., invisible at night.). Somehow he fumbled his way through it, set off a flare and was rescued so he could tell the story! When we heard this, we realized we had never even seen a flare ignited  much less actually done it ourselves. 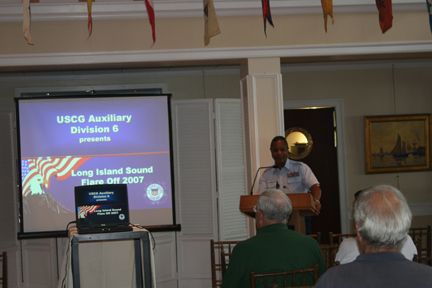 Captain Don Lloyd of the USCG Auxiliary Division 6 delivered a compelling lecture on the rules and requirements. Before heading out to the beach for the hands on experience, Captain Don Lloyd of the USCG Auxiliary and Officer Gary Olivier of Rye PD, Master Mariner and member of the USCG Auxiliary took us through a lecture on the USCG and local authorities’ requirements for onboard visual distress equipment as well as principles and procedures for safely and effectively deploying it. The USCG requirements are very specific about the signaling devices every vessel must have onboard, which varies with length of the vessel. Only approved, unexpired flares are acceptable (see figure for requirements and recommendations). 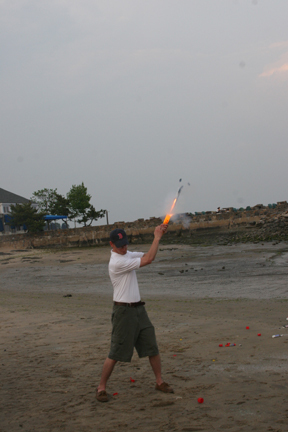 There are three things our instructors stressed: 1) the USCG requirements are the minimum 2) most manufacturers will tell you the pyrotechnics do not expire (so despite the USCG expiration date limits, they urged us to keep our old flares as back up for an emergency.) 3) the biggest impediment to proper use is inexperience. You must have the full complement of unexpired flares to meet the requirements, so keep the rest, because if stored properly they won’t go bad and may be exactly what you need to be seen and rescued. Approved signals increase your chances, but anything that works is good  waving two orange life jackets for example! Familiarize yourself with your signals and procedures before leaving shore. Officer Olivier demonstrates deployment of a non-SOLAS hand flare. We learned many other valuable lessons that evening. We were told that some of the old plastic orange pistols were recalled because once they were opened they could not be closed  And in the actual exercise on the beach, owners identified two pistols that did not work. We also learned that the old standard shells that look like 12 gauge shotgun shells have been replaced with a new design that fits in the same gun. The difference is that the old shells would go up about 250 feet while the new ones go to about 500 feet. The higher power guns were recommended due to the vastly higher candlepower of the cartridges they accept. 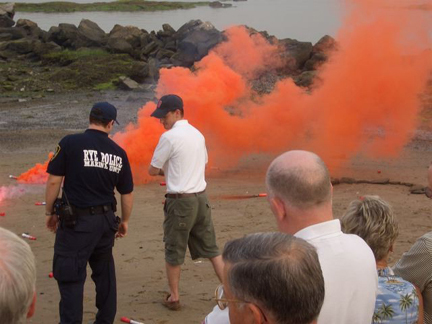 Immediately following the classroom portion of the training, all went to the beach with expired flares and signaling devices in hand. Our instructors kept a close watch and ensured that risk of accidents would be minimized. Two police boats were stationed offshore, one from Rye PD the other from the Village of Mamaroneck PD, to keep vessels out and to secure a safety zone for the firing range and to have an opportunity to see what the different devices actually look like set off. It turned out to be great training for everyone involved. The police boats even shot off some flares of their own to show us on the beach what the flares would look like from the vantage point of the observers. Little did we know, we actually had one flare that landed exactly where the police boat had been before moving to avoid a descending flare. Handheld flares drip a very hot and caustic substance. They must be held away from the body and away from the life raft which the drippings can damage. Three or four at a time, we first learned to ignite hand held flares and orange smoke signals, then rocket and parachute flares, and finally pistol flares. There was a broad range of pyrotechnics from various manufacturers. The interesting observations occurred when participants fired off SOLAS vs. non SOLAS devices. It clearly became obvious why SOLAS approved devices are recommended for offshore use and why it is worth having these despite the higher pricing. The SOLAS devices were by far more visible, brighter, higher flying, longer lasting and more likely to save your life under trying circumstances. Everyone had a chance to set off hand signals (flares and smoke), Despite the advice to keep our flares when expired, we learned that it was important to actually experience firing one off  it is not intuitive  and we also learned that some actually do expire. There were numerous “duds” tested. Some as old as the 1970s did absolutely nothing, some from the 80s were erratic in behavior, and most from the 90s (but not all depending perhaps on how they’d been stored) were fairly reliable. So perhaps technology has advanced or perhaps they really do go bad. In any case, you need to satisfy the minimum requirements for unexpired devices then supplement with expired signals as backup. Hey, if you’re out there, and you need help, expiration date won’t matter if it helps you get rescued. The attendees learned that the USCG Auxiliary consists of some 37,000 highly trained civilian volunteers who assist the Coast Guard in its duties. Their primary responsibility is to assist boaters in need and to patrol the waters and report suspicious, dangerous or unlawful behavior to the Coast Guard or local law enforcement officials. They are also active in educating the boating public on all aspects of boating safety, including teaching courses on required safety certifications, navigation skills, and courtesy vessel compliance inspections. Both the US Coast Guard and the USCG Auxiliary are under the command of the Department of Homeland Security. The distinction between a SOLAS flare and other types of handheld flares was dramatic. The instructors and support crew made a very impressive team. They worked diligently to make sure everyone learned safety and effective technique, gained understanding of the rules and guidelines, and had a good experience overall. Special thanks to all team members from the USCG Auxiliary, Rye PB, especially Officer Gary Olivier who trained us in deployment of the pyrotechnic devices, Mamaroneck PB, and the Rye Fire Department. We could not have asked for more. We have had so many genuinely positive comments from the attendees, including visiting members of other local clubs, and every one of them expressed how valuable the experience was. It was encouraging to see several families in attendance and that young crew members had a chance to learn these valuable lessons first hand. Rocket flares are shot up at an angle so they don't land back onto your boat. That every vessel is required to have a copy of the USCG Requirements aboard? That every vessel is required to comply with USCG requirements as well as local state requirement and requirements of any state whose waters you are sailing through (extra copies of the NY and CT rules are available at the club). That violation of the USCG requirements can result in a fine of up to $1100. That the USCG Auxiliary does free Vessel Safety checks to help identify if you are in compliance. The USCG may board your vessel at any time and may conduct an inspection of equipment compliance for the State and Federal waters you’re boating in. It is illegal to fire off a flare except in distress. 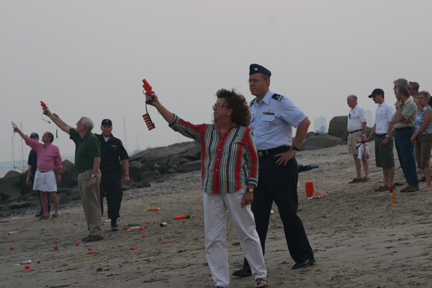 Coast Guard no longer accepts expired flares. USCG Auxiliary, fire departments and police boat departments may accept them as they use them for drilling purposes. Call your county administrator for advice. Should anyone have questions or wish to schedule a Vessel Safety Check or training session, please contact Don Lloyd at dlloyd 12@dcmed-arb.com. The plastic guns we all have were the easiest to use yet among the least effective and potentially dangerous in careless hands. The old cartridges recently have been replaced by much more effective larger cartridges.